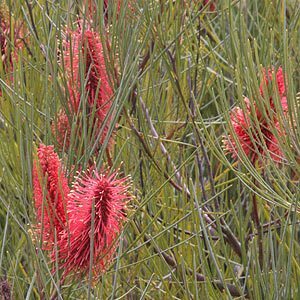 Hakea are a variable group of plants, With many species having attractive flowers. A very useful landscaping plant, Hakea are attractive to birds and bees, they are easy care and drought tolerant once established. 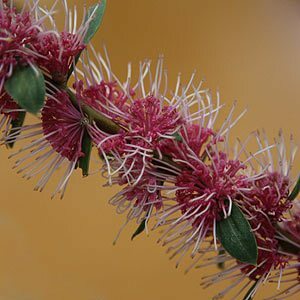 Hakea are popular ornamental plant related to Grevilleas and Banksias, they are not grown as widely as these relatives, however some species deserve a spot in the garden. All species prefer a sunny well drained position and with over 140 species their is the usual variety in size and shape. Pictured right is Hakea bucculenta, one of the most popular species for the garden, grown for the brilliant red flowers with a spike like appearance. Also known as ‘Red Pokers’ this species is from Western Australia. Variable in growth habit, this species has narrow needle like leaves and will reach between 1m and 4m in height depending on soil and conditions. All species flower in winter through to spring with varieties such as Hakea ‘Burrendong Beauty’ adding colour to the winter garden. Hakea salicifolia (Willow-leaved Hakea) and Hakea sericea (Bushy Needlewood) are readily available and are spreading shrub like bushes growing to 3m in height. With species from New South Wales as well as Western Australia care requirements vary. As most of the desirable garden forms are from Western Australia it is important to look for grafted varieties as the natural rootstock does not perform that well in the eastern states. Good drainage is essential, fertilizer is rarely required and if used must be a low phosphorous native plant type. All species are regarded as drought tolerant once established. Clay soils that are poorly drained are a problem. Pruning can be carried out if required, in fact most species can be cut back by 50% and more as long as sufficient foliage is retained. H. bucculenta (pictured) is known as ‘red pokers’ with showy spikes of red flowers and needle like foliage. Reaching between 2 and 4m in height it has the most attractive flowers of the genus and is used widely in gardens. Upright in habit with fine needle or pine like foliage. Flowering from winter through to early summer, the flowers are followed by woody seed capsules. H. myrtoides is a very low growing species reaching less than 1m in height. Terminal flowers are red on arching stems. A useful ground cover plant. H. salicifolia is the popular ‘Willow Leafed Hakea, useful as a hedging plant, fast growing with white flowers from winter to spring. H. laurina is commonly called the Silky Hakea, a small tree to 4 -5 metres sometimes grown as a street tree.